Though the house was built in 1876 for William S. Williams, it is best known for the Davisville pioneers that became the owners in 1880, John Craig Drummond and family. John Drummond, a prominent Davisville farmer, purchased the home so that his children could attend Davisville schools. As part of the gold rush in 1849, John C. Drummond came with his brother, Lewis C. Drummond, to Sacramento from Rahway, New Jersey. John worked hard as a blacksmith, saving money so that he could buy land. In about 1861, he acquired 700 acres seven miles southeast of Davisville. He was very successful raising grain and stock, and was a noted horse trainer. In 1862, John Drummond married Sarah Frances Reid. John and Sarah Drummond had two sons, who died in infancy, and four daughters: Anne, Bettie, Lillian, and Catherine. Sarah Drummond lived in the house until she died in 1917. 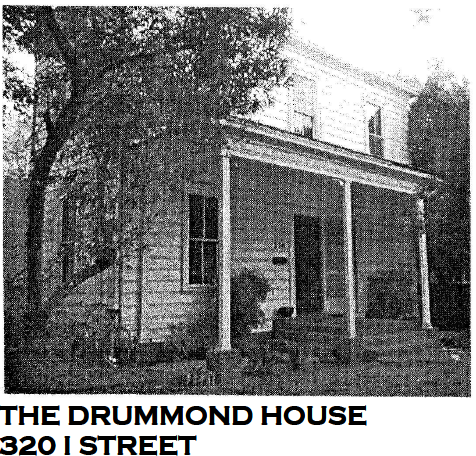 When Sarah Drummond died, the property was divided among her three remaining daughters. Mrs Lillian Hafner, through inheritance and purchases from her sisters in 1918, kept the house and the three lots associated with it. In 1935, she bought two lots from the Catholic church, thereby owning half of one side of the block. This two-story, symmetrical house is Italianate in styling and formal in feeling. The roof is hipped, the eaves are soffited and there is a complex molding at the eave line. The window moldings with their slight pediment make an elegant reference to their classical precedent. Originally a porch ran across the entire front of the house and the posts were more ornate. The citrus, and palm trees are part of the 19th century planting scheme. Phyllis remembers that the children in the neighborhood thought the house was haunted because no one lived there and it was always dark. She remembers playing with the other neighborhood children and sometimes sneaking into the house to check it out. Drummond family lived here? Lillian Hafner was an eccentric lady, who kept the house closed for most of the thirty years she owned it. She lived in Oakland and came up to her home in Davis during the summers to can fruit from the trees in her yard. She usually wore black and rarely left her house and yard. purchase, there was one electric circuit in the house. They rewired the entire house, and had the house plumbed. In 1956, Mr. and Mrs. John H. Wall bought the property. Mr. and Mrs. Kurt Kreith purchased the house in 1960. Kenneth Gebhart and Rhonda Reed purchased the house in 1980. They lived there for one and half years, rented out the house for 22 years, and have recently returned to live in and renovate the house.